Are you looking for a form builder plugin but aren’t sure which one to go with? Whether you’re new to all this or are looking to break away from a plugin that isn’t working for you, we want to help! We think choosing the right plugin for your website is so important because it can make all the difference to your overall efficiency, data management and conversion rates. So, if you’re unhappy with the way things are now but just can’t decide which one's right for you, keep reading. We’ve already compared Formidable Forms with Gravity Forms, but today we’ve got another heavyweight form builder to discuss– Ninja Forms. Ninja Forms may very well be on your list of form builders to try out and learn more about, so we thought we’d come to the rescue and lend a helping hand. As always, we aim to be as fair and objective here as possible. We’ll be discussing what each plugin can offer and the key elements to look for in a form builder. 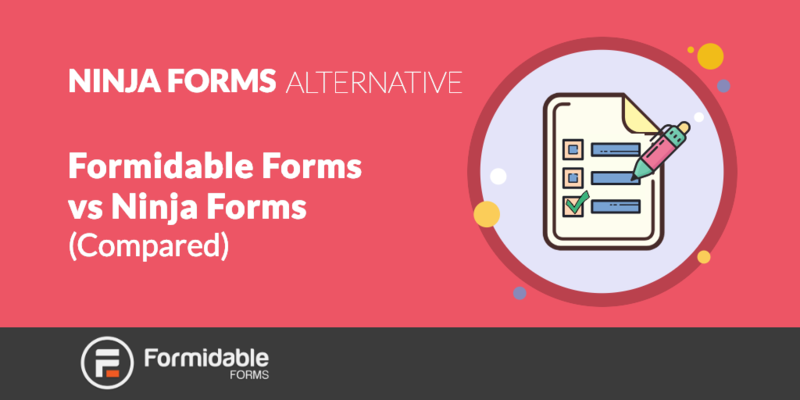 Formidable Forms is a simple to use form builder that gives you control over submitted data and how you use it. It's a complex form builder made easy with its handy drag and drop design. Our ultimate goal is to provide a tool that sparks confidence in our users to take on big projects, without the need for big resources or heaps of experience. We believe that anyone can find success with the right tools and a little bit of confidence that their project can become a reality. Ninja Forms prides itself on being a developer-friendly form builder. It’s relatively easy to use with WordPress and allows for a lot of customization. Ninja Forms' overall goal is to offer more integrations than competitors such as Gravity Forms, but at a lower cost. What they offer is a free alternative to get started, and flexible pricing options to stay affordable. Both Formidable Forms and Ninja Forms are easy to use, with a drag and drop interface to help you build each segment of a form. We pride ourselves on being easy to learn for beginners but not limiting for those who know a thing or two about form building. Ninja Forms operates in a similar way and is available on a basic level to a pro level. They have a really handy form layout builder, which makes forms with side-by-side fields. This makes it easy for beginners to use. However, as Ninja Forms relies on external add-ons for vital features such as conditional logic, multi-paged forms, file uploads and form layout, it's more time consuming to use. Formidable Forms doesn't expect you to download separate add-ons to access features like these, so it's mostly simpler to use. Both plugins offer great support with a lot of handy documentation to help you learn and get the most out of using each plugin. Support operates through a simple ticketing system for both plugins. The level of support and waiting times for ticket responses depend on what type of user you are for each plugin. With Formidable Forms, we have tiered support for each type of member. Our standard users will typically receive a response withing 12 business hours. Priority support is available to our Business plan users, which we aim to respond to within 6 business hours. Our Elite users get a response within 2 business hours. Ninja Forms operates a similar tiered support system. Their free users will usually get a response within 24 business hours and their paid members will get a response within 8 hours. Comparing support, you can see ratings for both plugins on WordPress.org. Formidable Forms' support has a rating of 4.6 vs 4.4 for Ninja Forms. Formidable Forms currently offers a wide range of integrations including payment options like Stripe and Paypal, eCommerce platforms, as well integrations with marketing and CRM systems like Salesforce and Hubspot. This means that what we provide goes beyond just form building. We want Formidable Forms to be a multi-faceted business tool. Many of Ninja Forms' major features are available through separate add-ons. This means that their plugin is built with integration in mind. Ninja Forms offer similar integrations to us, but with a wider range of available apps. They also support popular business apps like Trello, Slack and ConvertKit, on top of the usual payment, CRM and eCommerce integrations. Both plugins operate with a freemium model – which means there’s a free version and a premium version, depending on your needs. We currently have four plans to choose from. For 1 site it's $49 a year and for 3 sites, with a few integrations, it's $99. Our top tier plans have more integrations and features to offer for those who need them. Our Business account costs $199 for up to 15 sites, and our Elite plan is $399 which supports an unlimited amount of sites. Aside from the free version, Ninja Forms also offer four different plans. For one site it's $99 a year, for 20 sites it's $199 and for their agency package with unlimited sites support, it's $499. Their final option is the à la carte plan which allows you to purchase each add-on separately. That way you only get the exact features you want, which can change as your business grows. Prices for this range from $29 to $129 for each add-on, depending on how many you need. One of the key elements of Formidable Forms is control over what you do with your data once you've collected it. This makes it stand out among many of our competitors. One of our most popular features is built-in Views. This allows you to display a list of all your collected data on your website. For example, it's handy for real estate listings, job boards and event calendars. Following on from the previous point, you can also do more with your data through graphs and charts. You can display entries on any View, page, post or widget. Any charts you create will display live data which will automatically update whenever new entries are received. If you need users to update their own form submissions, they can do so with our front-end editing tool. You can choose which submissions are editable for your users, whether that's a View, a list of clickable entries or a user's only entry. Some forms require users to input details of multiple items at once. With our Repeaters feature, you can do just that. Users can add a group of fields any number of times. For example, you could use it to list multiple contact details or names for a sports team registration form. Sometimes you need multiple forms to interact with each other behind the scenes. With our Cascading lookup fields feature, you can populate fields with values from other forms. Values can automatically be retrieved and used in a dropdown, checkbox or radio field. For example, if you need customers to be able to search for car models, they can select the 'Year' in one field and 'Make' in the next one. From there, the 'Model' field will only show car models related to the chosen make. It will automatically pull that data from elsewhere to save users time and hassle. Want to add more variety to your forms, either to boost conversions or get more accurate results? You can add time, scale, slider and toggle fields to your forms to collect different types of submissions. Not everything can be answered with a checkbox or a one word answer. These fields can give users the freedom to give you more accurate answers in questionnaires. If you want more control over how your form looks and functions, you have the option to customize the HTML. You can add a CSS class or move fields around how you want, as well as having control over what sections are visible to your users. The era of paper forms is coming to an end. With Formidable, you can ditch the paper and allow electronic signature submissions on your forms. This saves everyone time, and reduces the reliance on paper. With online forms so important to businesses and individuals alike, we think it's essential that forms are accessible to all. We have taken WCAG guidelines on board to make our forms more accessible and screen-reader friendly. Ninja Forms' interface and form layouts are really clear and simple to use. This makes it great for beginner form builders and those looking for a simple solution. Ninja Forms makes use of a handy payment field option, which can make taking payments through your forms a lot simpler. This is particularly useful for eCommerce websites who require a seamless payment process. Tooltips are really handy to provide more information to help people fill out a form. A user will be able to hover over an item and a small ‘hover box’ will appear to give them more information. This can help users fill in forms more accurately and improve conversions. If you want to limit the amount of characters a user can submit on your form – either to manage responses or to ease website loading time – you can with Ninja Forms’ character counter feature. Ninja Forms allows users to save entries as a basic PDF which could be handy if they need to share form submission data with customers/colleagues. Ninja Forms currently support a wide range of add-ons with other apps to make everything easier to manage from one place. However, version 3.0 isn’t currently compatible with many of their add-ons, so bear this in mind. Overall, Ninja Forms is a clean and clear, easy to use form builder. It has a lot of functionality, but a great deal of their vital features are available as separate add-ons rather than part of the core plugin. On the other hand, most of Formidable Forms' features are built directly into the plugin and are accessible to users at a click of a button. That doesn’t mean you can’t use it with other apps though, as it's open to many integrations too. Read more: How Formidable Forms helped one user find online success by linking Formidable Forms with Zapier. Many users come to us looking for a simple and effective way to manage and display submitted data. This is what makes Formidable Forms really stand out in the market, as many other alternatives don't focus on this area. Another thing that makes Formidable Forms so powerful is that we're constantly working on developing new features and improving current ones. Unfortunately, Ninja Forms' development has stagnated somewhat lately. Their Changelog shows that it's been a while since a big new feature or change was implemented. When changes are made, a common issue among users is that installing updates causes websites to crash and go offline. Another common issue is that Ninja Forms' free version doesn't allow you to style your forms the way you want. Formidable Forms, on the other hand, offers a visual styler within the free version. So, that's something worth bearing in mind if you're considering free plans. However, if you’re looking for easy form layouts and to use plenty of different add-ons, then Ninja Forms could be a good choice for you. Their à la carte plan is also really handy for those looking only for specific add-ons, who would rather not purchase a full plan. We hope this post has helped you understand the key features of each plugin, and our differences, to help you make the best possible choice for your needs. Want to give Formidable Forms a try? Take a look at our list of features to see exactly how we can help you build the website you really want. With our drag and drop form builder, it's easier than ever! Please can you make a comparison table? Thanks.